I love the benefits of running: stay healthy; defy my age; increase energy; stress reliever; meet new friends; eat quilt free; & SOCIALIZE!! NYM: I was so intimidated by the big marathon in a big city as I’m a country girl. Just getting to the start line, taxi, ferry, buss, walk, took two hours. The experience was so fun, wild & crazy & I loved it! 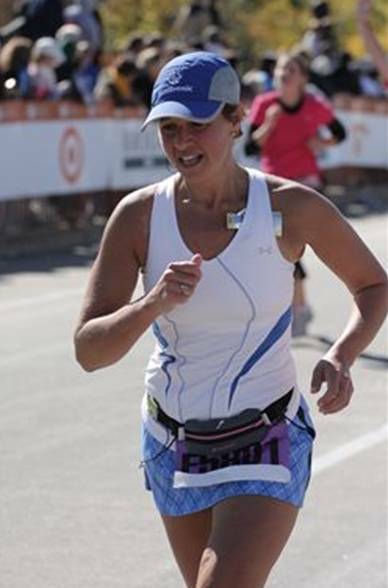 I love to run races and help others obtain their goals – It makes my day to have a fellow runner do well, whatever that may be for them. At the NYM, was not an official pacer but stayed w/ my best running friend to ensure she did well & met her goal. We also picked up a few strays on the way who thanked me at the finish for helping them get thru the challenging course. 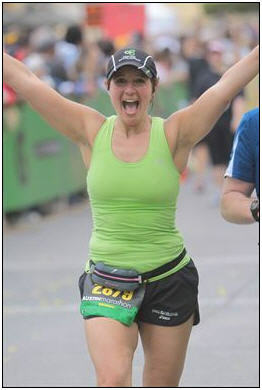 It was the most satisfying accomplishment -- I never felt better about a race! You will definitely have fun; lots of high fives; encouragement; bantering w/ the spectators; and obtain your goal. Enjoy the experience and celebrate your accomplishment at the end. Don't be too hard on yourself about a specific time! Completing a marathon is a huge accomplishment, which the majority of folks will never do. I encourage runners to have 3 times in mind and be flexible to change mid-run; weather; how you feel; life in general may affect your goal. Volunteer my time for cancer; kids; courage center; American Disability Act, etc.